Massaging your feet normally helps relieve some of the pain. Consider electric foot massagers and plantar fasciitis. The big question is: can such a device actually help heal a problem like plantar fasciitis? Well, if a simple tennis ball or frozen golf ball can be used as a massage treatment for plantar fasciitis then surely other tools on the market can be helpful in reducing heel pain. Obviously, the best foot massage you could get would be from a trained therapist – or so one would think. Many people, however, have neither the time nor funds to get regular foot massages in that manner. In addition, many people do not care to learn or do not feel comfortable performing appropriate self-massage. For these reasons, massage tools have become popular alternatives. Such tools can be categorized into four types: electric foot massagers, massage rollers, balls, and stones. This article, the second in my series on foot massage tools, focuses on the electric foot massager tool type. As you probably are already aware, your feet have a higher concentration of nerve endings than any other part of your body. Because of this, massagers in any form can help stimulate your feet, relieving at least some of the soreness and stiffness associated with the day-to-day abuse absorbed by your feet. I say this somewhat cautiously because you will find that much of the advertising for massage tools seems to possibly exaggerate the benefits of the tool. Granted, any given tool may be the best answer for a given individual. You can read the amazing results that a specific individual had by reading their testimonial or comment on a given blog post. Remember that each of us is different, however, so the tool that works for some other person may not be the best for you. Before investing in any type of tool, think about your own feet. Determine where your feet hurt the most and, if possible, what is triggering any pain you might feel. Once you have done this, do some research to determine what type of tool might help relieve the type of pain you are enduring. Also, consider how much you are willing to pay to relieve that pain. It just feels good – As noted earlier, our feet are perhaps our most used body part. They often are abused by tight shoes, standing too long, or through exercise. At least some level of relief from general muscle fatigue and stiffness, as well as nervous tension should result from massaging your feet. Stimulated circulation and oxygenation – Almost any type of massage will help in this way. The better the massage, the more this benefit will be enhanced. Temporarily increased blood circulation helps release toxins and lactic acid that may be trapped in muscles and tendons. It also increases the flow of nutrients to cells in those muscles. An aroused immune system – This may help promote healing. It certainly won’t hurt! Decreased stress levels – Researchers have noted that foot massage has led to a significant reduction in stress. Note that a good number of massage tools are described as being reflexology tools. Reflexology massage is based on the process of massaging specific areas on your foot, each area supposedly having nerve endings that are connected to a specific organ in your body. The process is intended to stimulate circulation, get rid of stress, and promote healing throughout the body, not just on your feet. Obviously, to claim this whole-body benefit, you must first accept the concepts of reflexology. You can find doctors and individuals who swear by it, others who say it is not rooted in scientific fact. 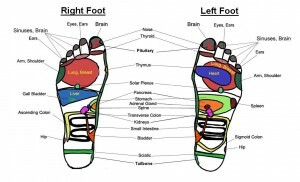 If it is true, then reflexology-capable tools can activate the pressure points on your feet and release energy that will not only help regenerate your feet but also spread healing to other parts of your body. There are numerous foot massagers that fall into this category. Price-wise, they range from affordable to possibly out-of-your-budget. Their function ranges from simply providing steady vibration to multiple speeds and multiple options such as rolling, kneading, heat, and hydro-therapy; options that provide a deeper massage for your feet. Simple but steady vibrating massagers can be helpful for general relief of foot stress and may provide some level of myofascial release. Such a tool will probably not have any real healing effect if pain exists, however. The video below provides a quick review of one type of massager. This one provides a little more than just vibration but it isn’t elegant, by any means. At the high end of the price and function spectrum, massagers may provide a combination of options. These may include options such as rotating nodes that can provide a deeper, penetrating massage; compression massage, where you place your feet into “wells” that inflate and then deflate; and infrared heating settings. Options such as these provide an increased chance that the massager will actually help heal a problem such as plantar fasciitis. 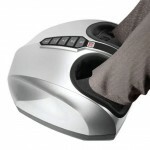 One great thing about using electric foot massagers is that you can multi-task while you are receiving your massage. Since you are in a sitting position you can be watching a movie, reading a book, or talking on your phone at the same time. Not everything is perfect when it comes to purchasing a foot massager machine, of course. There is always a possibility for dissatisfaction. On the videos we saw concerns/complaints about the high price, the weight of the machine, and the fact that they can be uncomfortable due to too much pressure. Just remember that we are all built differently! Another potential issue with mechanical devices such as an electric massager is that it may break or work improperly. In written reviews, this appears to be a fairly common complaint. So, can we answer the question as to whether electric massagers can potentially heal plantar fasciitis? Certainly they have their place in the line of treatments available and, for some, they may help to significantly reduce the pain. What has been noted all along, however, even within this article, is that each person is different. Give it some thought and share your opinions. What type of massagers have you tried? Were they sophisticated? Was your massager worth the money? Did it get stuck away in a closet, never to return to service after a short period of time? Your input is appreciated. A frozen golf ball for self-massage treatment? Wow that is a great idea! My wife will often massage her feet after work while watching TV. I once bought her an electric foot massager (from a well known department store) but it turned out to be a piece of junk. The heating element failed after the third use. It was a cheaper model, but I guess you get what you pay for. I’m now looking for a better model for her…something that has a warm water foot bath massaging combination. My son-in-law used a frozen golf ball to treat his plantar fasciitis when it first flared up on him (see his story on the Forum). That’s where I first learned of that treatment. I used it too and it helped. There are so many electric foot massagers available on the market and yes, you get what you pay for most of the time. I’ve tried several (prior to plantar fasciitis) and they didn’t do much for me. Several models that I came across during my research included hydrotherapy massage. If you do purchase one, come back and let me know whether it was a good purchase or not. You can help me develop a review of the product so others could benefit from your experience. You are very welcome, of course! When you mention “knots” in your feet it makes me wonder if another type of treatment might be worth investigating in addition to any type of massager. Check out my post on deep tissue massage and a second one on trigger point therapy for your feet. Getting rid of knots (trigger points) is one of the key reasons for these techniques. I’ll note that getting rid of the knots via deep tissue massage can be a bit painful at first so don’t put too much pressure on those trigger points until they start to reduce. You do have to be a bit careful with some of the foot massage tools, also. The wrong ones will not provide comfort (as you noted in regard to your grandmother’s gadget). The UComfy Shiatsu massager is a very nice item and has had a lot of positive feedback. Be sure to look for feedback on whatever product you choose to purchase. I hope it will help relieve some of the discomfort. 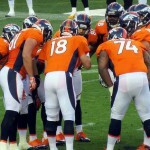 Great article, really helpful to me in places! I landed up here because I was looking to buy a similar product for my mother, She recently had a knee op and is having trouble with her feet ( well her right foot to be exact! ). 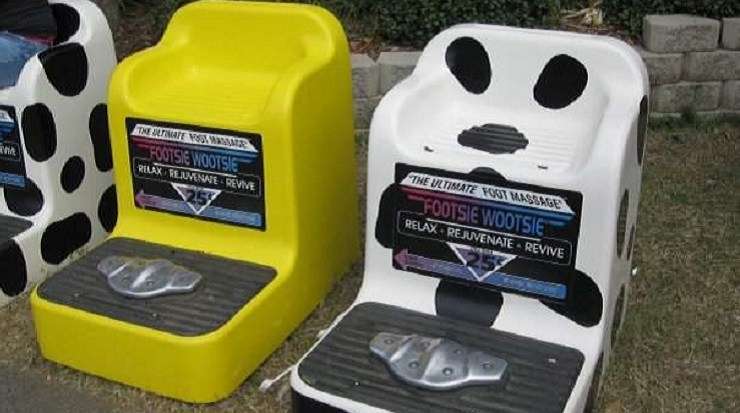 Would these sort of machines relieve that sort of foot pain? Hi Chris. Sorry to hear about your mother’s knee problems and subsequent foot pain. Based on what you’ve said I really cannot answer your question. First, there are many causes of knee issues (injury, osteoarthritis, cysts, infections, even pinched nerves somewhere else in the body, plus others). I assume your mom had a problem with her knee which led to the operation. Knee injuries and other issues can certainly cause foot pain, if for no other reason than it can cause one’s gait to change. If the pain is related to that type of change then she would need to see a therapist to help determine how to correct the problem. On the other hand, a massager could help reduce some of the pain but it probably wouldn’t get rid of all of it. Sorry I can’t provide a more specific response. Another interesting machine I did not know existed. thanks! I definitely need a good foot massage. I once read that the many nerves in the foot are connected to the organs in our bodies. If one part of the foot hurts this means an organ is not right. I’m not sure if this is true. If this thing can temporarily increase blood circulation, will it help to unblock and heal other organs in the body? Thanks for your comments, Michael. In answer to your question, what you read about is called reflexology. Many, many people, including many therapists, believe that reflexology is true and that through our feet all organs and parts of the body can be affected positively. The truth is, there is no scientific facts to back this up. Relatively recent studies into reflexology techniques showed no conclusive evidence so “scientific fact” does not support reflexology beliefs. 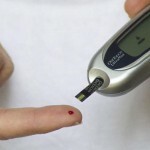 The more commonly held belief is one of trigger points. These are places on our body where tendons and muscles get into knots that can be quite painful. Trigger points are believed to “refer” pain to other areas of our body. For example, trigger points in our calf can refer pain to the bottom of our foot. Meanwhile, even though massage is not usually a cure, in and of itself, for foot pain it is an established fact that foot massage can be relaxing and can relieve stress. That’s because the massage, in whatever form, helps increase blood flow, which brings about healing, drives out toxins from muscles, and helps eliminate tight spots (knots) that gather in our feet due to the stress of bearing all of our weight. Very interesting post! A good reflexology foot massage is just what we need after a long day, helping us reduce our foot pain, improve blood circulation, and relieve headaches, anxiety and PMS or menopause symptoms. Everything in a relaxing and fun way! Thanks for your comment, Foot Massager. A good foot massage can be incredibly comforting at the end of the day. It is “fun” as you have noted. That great foot massage, combined with any other recommended care (typically prescribed by a doctor or understood through personal research) can also lead to elimination of potential foot problems such as plantar fasciitis. 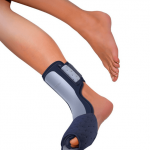 If someone already has heel pain, a good tool to use in addition to the electric massager might be a night splint such as the Futuro adjustable splint. I began feeling the arch soreness two weeks back. level if I attempt to operate by way of it to complete? Earle – For whatever reason, your comment and question, which appears to have been written on October 5, did not show up on my site until today. Obviously, if your race was the week of your comment, I’ve missed it. Sure would be interested to get an update from you. The answer to your question is not necessarily simple. In general, if this is plantar fasciitis, then yes, the suffering will subside if you lay off your running for a bit and initiate some normal RICE care techniques. If you’ve continued running on it and it has gotten worse, you should see your doctor or even a foot care clinic. Once the pain has gone away, you need to start slowly and avoid sudden increases in training distances. Take care! This looks like a great thing – I have plantar fasciitis so I can relate to that curse. Honestly, it haunts me mainly in the warm seasons and since my job requires me to be mobile and mainly walk/stand, it’s a total PITA. Yet, this electric massage unit seems awesome and might help. I know putting your feet in cold water for 20 mins helps, but it’s time-consuming and flu-friendly. Simon – You commented about the same time I took off on a land and cruise tour in Alaska! Just got back yesterday. Fantastic trip, but talk about a chance to build up plantar fasciitis pain! We walked way more than usual, even just to get from the back of the cruise ship to the front was a hike. As you are well aware, significant changes in our walking/running patterns can bring out the worst in our feet. Fortunately, I’ve learned enough about pf and have changed my footwear so that my feet aren’t bothered by it as much as in the past. Sorry you have a recurring issue with it. I’ve used several methods to help my feet including tennis balls and massage. The Ucomfy massager is the best I’ve witnessed among electric massagers – much better than the cold water treatment for me. Thanks for this great and informational post . Of course foot massager is great product for us include plantar fasciities . Having your own foot massager at home can do more than just relax you also. In addition to that, it can leave you feeling refreshed and invigorated. It will be as if the stress you have been carrying around with you all day has been peeled off you like the skin of an orange. With just a few short minutes of setup time, you can soon be enjoying an invigorating foot massage. The effect it can have on you may just turn your entire day around in as little as a one half hour foot massage treatment. Yes, you are absolutely right, Talisca. Since my site focuses on foot pain I kept my post related to the ways the massager would cure foot pain. But as you note, our whole body is affected by how our feet feel. Even now, my feet are yelling at me that they would like some tender care so I need to use a little massage time tonight. I’ve been under the weather a bit the last few days and a lot of my muscles (shoulders, neck, calves, and feet included) have tensed up. Thanks for sharing! Thanks for this great posts and comments . It is so helpful and informational . Electric foot massagers are great for many reasons . Getting regular foot massages can offer a lot of benefits. These benefits include, but are not limited to: Relaxation , Improved Blood Circulation , Pain Relief , Nerve Stimulation , Warming Your Feet . Thanks much for your comments. I haven’t been massaging my feet as much lately and I can tell the difference. The little tendons start getting tighter and my plantar fascia gets sore spots when I don’t address my feet appropriately. I really appreciate your foot massager review, too! You’ve packed it with lots of great info and share all the benefits of using massagers regularly. You also have reference to manual foot massagers, which are much less expensive of course. If one can’t afford an electric massager then a manual one can be a good alternative.